Sport trim. Trailer Hitch, SIRIUS SATELLITE RADIO, RADIO: 430, Brake Actuated Limited Slip Differential, CD Player, 4x4, MAX TOW PACKAGE, CONNECTIVITY GROUP, QUICK ORDER PACKAGE 24S, ENGINE: 3.6L V6 24V VVT. CLICK NOW! 4x4, CD Player, Brake Actuated Limited Slip Differential Child Safety Locks, Steering Wheel Controls, Rollover Protection System, Electronic Stability Control, Bucket Seats. 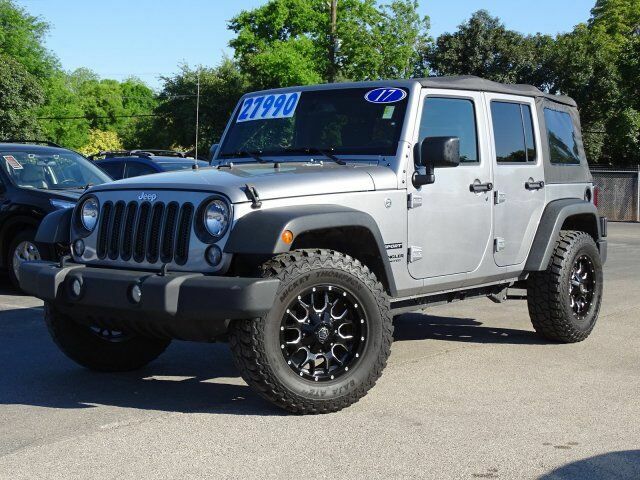 QUICK ORDER PACKAGE 24S Engine: 3.6L V6 24V VVT, Transmission: 5-Speed Automatic (W5A580), Front 1-Touch Down Power Windows, Remote Keyless Entry, Deep Tint Sunscreen Windows, Leather Wrapped Steering Wheel, Chrome/Leather Wrapped Shift Knob, Power Heated Mirrors, Tires: P255/75R17 OWL On/Off Road, Power Convenience Group, Power Locks, Wheels: 17" x 7.5" Aluminum, Auto Dim Mirror w/Reading Lamp, Security Alarm, TRANSMISSION: 5-SPEED AUTOMATIC (W5A580) Hill Descent Control, Tip Start, MAX TOW PACKAGE Class II Receiver Hitch, 3.73 Rear Axle Ratio, Trailer Tow w/4-Pin Connector Wiring, RADIO: 430 Remote USB Port, CONNECTIVITY GROUP Uconnect Voice Command w/Bluetooth, Vehicle Information Center, Remote USB Port, Tire Pressure Monitoring Display, ANTI-SPIN DIFFERENTIAL REAR AXLE, SIRIUS SATELLITE RADIO, For More Info Call 888-539-7474, ENGINE: 3.6L V6 24V VVT (STD). Jeep Sport with Billet Silver Metallic Clear Coat exterior and Black interior features a V6 Cylinder Engine with 285 HP at 6400 RPM*. KBB.com explains "Still true to its original concept after 75 years, the 2017 Jeep Wrangler continues to deliver exceptional off-road capability with ever-increasing amounts of on-road civility in an affordable package. ".